What are the beeja mantras and what are petal mantras, and what is their relationship with Om/Aum? In what ways are they helpful in meditation. If anyone is going to start on meditation, from where he/she should start. What is their significance in opening the chakras? Beejas or Seeds are important single lettered or monosyllabic mantras especially in the tantric or agama tradition. They are extensively used in rituals, processes, and both for internal and external worship. Each mantra or beeja has specific energies contained in it. Once chanted properly the inherent power can be utilized by the sadhaka. Specific beejas are used during meditation on chakras. Each chakra have their beejas which when chanted with focus, helps to activate the chakra. For example om/aum is very famous single lettered mantra which is used during meditation and it is meditated between the space of the eye brows or in the heart region. Thus, beejas can be visualized and chanted in chakras during meditation. They are easy to chant when compared to long and complex mantras and have very high potency as well. This is one of the reason why beejas have got more popularity among the sadhaka population. The whole universe is Shakti and is pervaded by Shakti. Nada, Bindu, Varna are all forms of Shakti and combinations of these, and these combinations only are the Shabda corresponding to the Artha or forms of any particular Devata. The gross lettered sound is, as explained later, the manifestation of sound in a more subtle form, and this again is the production of causal "sound" in its supreme (Para) form. Mantras are manifestations of Kulakundalini (see Chapter on the same) which is a name for the Shabda-Brahman or Saguna-Brahman in individual bodies. Produced Shabda is an aspect of the Jiva's vital Shakti. Kundalini is the Shakti who gives life to the Jiva. She it is who in the Muladhara Cakra (or basal bodily center) is the cause of the sweet, indistinct and murmuring Dhvani which is compared to the humming of a black bee. Thence Shabda originates and, being first Para, gradually manifests upwards as Pashyanti, Madhyama, Vaikhari (see post). Just as in outer space, waves of sound are produced by movements of air (Vayu), so in the space within the Jiva's body, waves of sound are said to be produced according to the movements of the vital air (Pranavayu) and the process of in and out breathing. As the Svarupa of Kundali, in whom are all sounds, is Paramatma, so the substance of all Mantra, Her manifestation, is Consciousness (Cit) manifesting as letters and words. In fact, the letters of the Alphabet which are called Akshara are nothing but the Yantra of the Akshara or Imperishable Brahman. This is however only realized by the Sadhaka, when his Shakti generated by Sadhana is united with Mantra-Shakti. kundalini, who is extremely subtle, manifests in gross (Sthula) form in differing aspects as different Devatas. It is this gross form which is the Presiding Deity (Adishthatri Devata) of a Mantra, though it is the subtle (Sukshma) form at which all Sadhakas aim. Mantra and Devata are thus one and particular forms of Brahman as Shiva-Shakti. Therefore the Shastra says that they go to Hell who think that the Image (or "Idol" as it is commonly called) is but a stone and the Mantra merely letters of the alphabet. It is therefore also ignorance of Shastric principle which supposes that Mantra is merely the name for the words in which one expresses what one has to say to the Divinity. If it were, the Sadhaka might choose his own language without recourse to the eternal and determined sounds of Shastra. (See generally as to the above the Chapter on Mantra-tattva in Principles of Tantra, Ed. A. Avalon.) The particular Mantra of a Devata is that Devata. A Mantra, on the contrary, consists of certain letters arranged in definite sequence of sounds of which the letters are the representative signs. To produce the designed effect, the Mantra must be intoned in the proper way, according to both sound (Varna) and rhythm (Svara). For these reasons, a Mantra when translated ceases to be such, and becomes a mere word or sentence. Shrinu devi pravakshyami bijanam deva-rupatam Mantrochcharanamatrena deva-rupam prajayate. Mantrasiddhi is the ability to make a Mantra efficacious and to gather its fruit in which case the Sadhaka is Mantra-siddha. As the Pranatoshini (619) says, "Whatever the Sadhaka desires that he surely obtains." Whilst therefore prayer may end in merely physical sound, Mantra is ever, when rightly said, a potent compelling force, a word of power effective both to produce material gain and accomplish worldly desires, as also to promote the fourth aim of sentient being (Caturvarga), Advaitic knowledge, and liberation. And thus it is said that Siddhi (success) is the certain result of Japa or recitation of Mantra. As a Mantra-Shastra, the Tantras have greatly elaborated the Bijas, and thus incurred the charge of "gibberish," for such the Bijas sound to those who do not know what they mean. Though a Mantra such as a Bija-mantra may not convey its meaning on its face, the initiate knows that its meaning is the own form (Svarupa) of the particular Devata whose Mantra it is, and that the essence of the Bija is that which makes letters sound, and exists in all which we say or hear. Every Mantra is thus a particular sound form (Rupa) of the Brahman. 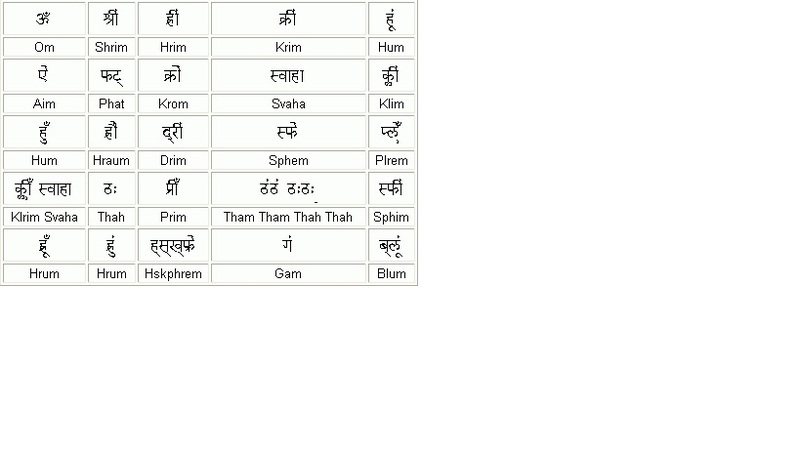 There are a very large number of these short unetymological vocables or Bijas such as Hrim, Shrim, Krim, Hum, Hum, Phat called by various names. Thus the first is called the Maya Bija, the second Lakshmi Bija, the third Kali Bija, the fourth Kurca Bija, the fifth Varma Bija, the sixth Astra Bija. Ram is Agni Bija, Em is Yoni Bija, Klim is Kama Bija, Shrim is Badhu Bija, Aim Sarasvati Bija and so forth. Each Devata has His or Her Bija. Thus Hrim is the Maya Bija, Krim the Kali Bija. The Bija is used in the worship of the Devata whose Mantra it is. All these Bijas mentioned are in common use. There are a large number of others, some of which are formed with the first letters of the name of the Devata for whom they stand, such as Gam for Ganesha, Dum for Durga. The Nitya Tantra gives various names to Mantra according to the number of the syllables such as Pinda, Kartari, Bija, Mantra, Mala. Commonly however the term Bija is applied to monosyllabic Mantras. The word "Mantra" comes from the root "man" to think. "Man" is the first syllable of manana or thinking. It is also the root of the word "Man" who alone of all creation is properly a Thinker. "Tra" comes from the root "tra," for the effect of a Mantra when used with that end, is to save him who utters and realizes it. Tra is the first syllable of Trana or liberation from the Samsara. By combination of man and tra, that is called Mantra which, from the religious stand-point, calls forth (Amantrana) the four aims (Caturvarga) of sentient being as happiness in the world and eternal bliss in Liberation. Mantra is thus Thought-movement vehicled by, and expressed in, speech. Its Svarupa is, like all else, consciousness (Cit) which is the Shabda-Brahman. A Mantra is not merely sound or letters. This is a form in which Shakti manifests Herself. The mere utterance of a Mantra without knowing its meaning, without realization of the consciousness which Mantra manifests is a mere movement of the lips and nothing else. We are then in the outer husk of consciousness; just as we are when we identify ourselves with any other form of gross matter which is, as it were, the "crust" (as a friend of mine has aptly called it) of those subtler forces which emerge from the Yoni or Cause of all, who is, in Herself Consciousness (Cidrupini). When the Sadhaka knows the meaning of the Mantra he makes an advance. But this is not enough. He must, through his consciousness, realize that Consciousness which appears in the form of the Mantra, and thus attain Mantra-Caitanya. At this point, thought is vitalized by contact with the center of all thinking. At this point again thought becomes truly vital and creative. Then an effect is created by the realization thus induced. Not the answer you're looking for? Browse other questions tagged mantras agamas meditation om chakras . What's the English transliteration of this Sanskrit mantra? What mantras are chanted when a snake bites? What exactly happens to Prarabhdha karma while performing “Yoganidra” in Meditation? From where do priests get invocation(Avahana) and other Mantras related to Shirdi Sai Baba? What are the shodashAdhAras the first six of which are the shatchakras? Is it ok if I misspell the mantras as I am a beginner? What are the letter of alphabets (varnas) associated with each of the Seven Chakras? Which scriptures mention Dhyana Mantras of the sixty-four Yoginis?